This 4 Inch Round Sealed Trailer Light is one of the most common replacements for recessed lighting on utility trailers, but can also be used on marine trailers as the lights are completely sealed. 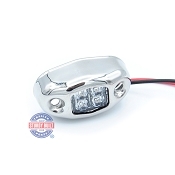 This is a three function light so it acts as the stop,turn,and tail/running lights for your trailer. It mounts to your trailer using a rubber grommet and uses the standard three prong plug found on most trailer lighting harnesses. If you need the Grommet and plug associated with this light see the 4" Round Sealed Three Function Incandescent Trailer Light Kit.